Each day you have the opportunity to choose your attitude. This Thanksgiving, choose to be cheerful and grateful. You've got nothing to lose. Look for opportunities to serve. Not just at soup kitchens, but in your own backyard. Offer a ride to that friend with the three kids. Just wash the dishes without being asked. Yes, even those grimy pots with the baked in crud. If Uncle Billy still insists on calling you by the wrong name and you told him 100 times. He's probably not going to stop now. Just smile, say hi and move on. If he's doing it on purpose, don't give him the satisfaction of letting him know it really bothers you. If someone gives you something you really don't like. Just say thank you and yes, you guessed it move on. Most of the time, it really is the thought that counts. By giving cheerfully and accepting gratefully we all get to be a bit happier. And that's one of the best blessings ever! I'm grateful that all my kids are in the same state and that we get to break bread together this Thanksgiving. How about you? What are you grateful for? Please let me know in the comments below. Happy Thanksgiving from Fly Me To The Moon! Need Help With Your Thanksgiving Table Decor? Are you a great cook who knows nothing about creating a beautiful Thanksgiving table? If you just nodded your head, this post is for you. Forget about the plastic tablecloth with the matching turkey plates and napkins. What's up with that anyway? Were they designed for people who forget what they're supposed to be eating on Thanksgiving? Anyone can learn the basics of how to set a lovely table for Thanksgiving. Here are my tips for creating an elegant setting for your wonderful food. Here's my little tablecoth secret. I cover my table with nice upholstery fabric I get from the bargain fabric store for $3.99 - $5.99 per yard. It comes in wonderful autumnal colors, resisits stains and wipes clean. 2. Placemats give a table setting a nice look. It also defines space for each of your guests. Go to a discount store in your neighborhood and look for nice ones with a bit of texture. If you have a small table and too many people forget placemats. 3. White or ivory dishes make your food look great. If you don't have enough of one kind you can: borrow some from a friend, mix two colors that go together (like blue and white, etc.) or go to the dolllar store and buy some. If you absolutely insist on disposable plates, please invest in some nice ones. Heavy duty paper plates are nicer than their plastic counterparts. If you decide to use paper plates, remember there's no rule that says you must use plastic utensils too. 4. Cloth napkins are lovely and come in wonderful colors. You can pick up nice ones in stores like Home Goods and Marshalls for very little money. But, I also like nice heavyweight paper napkins. They come in lots of beautiful solids and prints. IKEA always has a great selection. Stay away from those thin, cheap ones that have 500 in a long plastic bag. Cut flowers short and place them in small vases down the center of the table or at each place setting. Place branches in a tall clear vase. You'll find more ideas for simple Thanksgiving centerpieces here. My DIY Floral Design Tutorials are here. And even more diy floral tutorials here. Try some of these tips and I bet you'll have the best Thanksgiving table ever. Let me know how you plan to set your table this year in the comments below. There are many different kinds of cut red flowers. To most people red flowers = roses. But, at Fly Me To The Moon , we go way beyond red roses. Can you think of any cut red flowers I've missed? Which red flowers do you like best? Please let me know in the comments below. 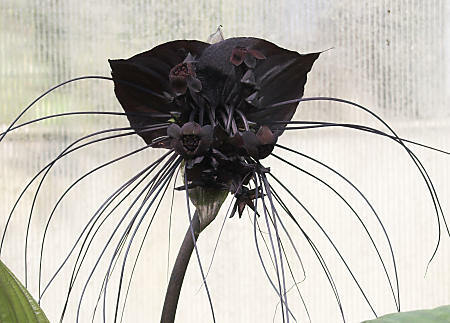 The black bat flower may be one of the scariest flowers I've ever seen. Just in time for Halloween. If I turned around at Fly Me To The Moon and saw one of these on my counter I would probably scream. But, since I was in the company of my fellow floral designers at Associated Cut Flowers when I first laid eyes on it, screaming was not really an option. Luckily the bucket of black bat flowers, or Tacca Chantrieri, was perched high atop a shelf where no one could run into them by accident. You have to admit the picture I took of the bat flower looks a lot more creepy than the first one. And let's face it. They really do look like bats. At $12.50 per stem wholesale, I doubt that there'll be a run on the bat flowers. But for a scary yet sophisticated Halloween Party centerpiece, they'd be my first choice. Ever woke up in the morning and said to yourself, "I'd like to make a boutonniere today, but I just don't know how?" I'm a florist and I don't recall ever asking myself that question either. 1. Place a ruler beneath the flower head and measure 1.5 inches. Cut the flower there on an angle. Throw out the rest of the stem. 2. Wrap the flower stem in floral tape beginning under the flower to the bottom on an angle. Do the same thing going back up the stem. Cut the tape. Stretch the end of the tape attached to the flower then stick it down. 3. Take the straight pin and stick into the tape on an angle, but don't let the pointy end go through the tape. That's it! You've made a boutonniere. Your boutonniere will last longer if you put in a small covered box or plastic bag in the refrigerator until you're ready to use it..
You can use a larger flower, but if you're not careful it may end up looking ridiculous. 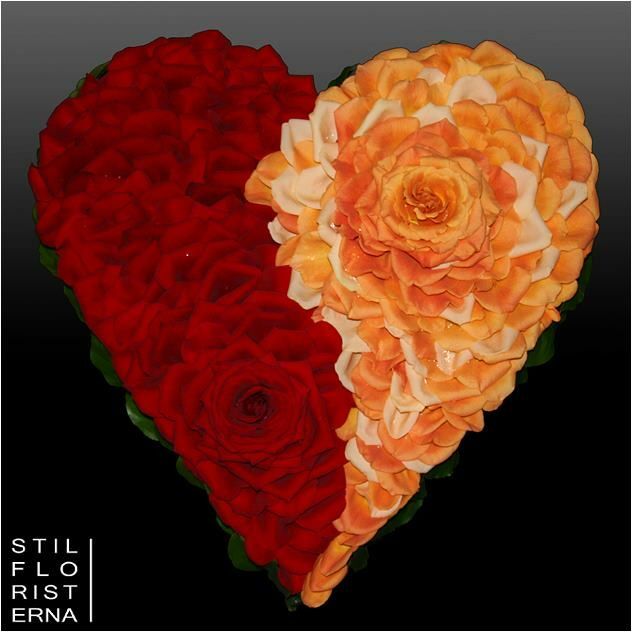 If you're afraid to cut the stem too short leave it a bit longer, but the focus should be on the flower not the long stem wrapped in floral tape. This truly is the most basic of boutonnieres. Foliage and other flowers can be added to reflect the color or style of the event. Be sure to use a flower that will last long. If you're not sure, ask your flower salesperson. Use a pin with a bead or pearl on one end if possible. They're a bit longer and easier to use when you're attaching the boutonniere to clothing. Please tell me what you think about the boutonnieres you've seen or made in the comments below.